ANOTHER PATCH I RECENTLY OBTAINED ON A TRIP TO TOMBSTONE/BISBEE AZ. AFTER NEARLY 40 YEARS OF COLLECTING AZ, I HAD NEVER SEEN THIS PATCH BEFORE OBTAINING IT. IT HAS NEVER BEEN DOCUMENTED IN ANY OF THE ARIZONA POLICE PATCH BOOKS. I BELIEVE IT TO BE FROM THE 1950'S, BUT THAT IS AN EDUCATED GUESS. IT MAY BE THE ONLY ONE TO EVER SURFACE IN THE HOBBY & ONE OF A KIND TO COLLECTORS. 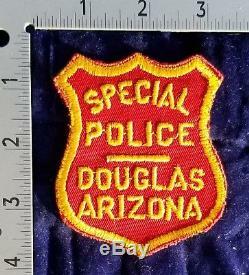 The item "UNDOCUMENTED DOUGLAS AZ ARIZONA POLICE SHERIFF MARSHAL PATCH ONE OF A KIND 50'S" is in sale since Wednesday, December 26, 2018. 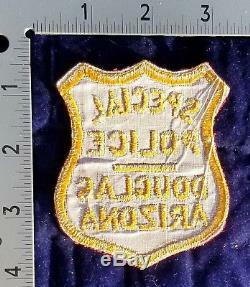 This item is in the category "Collectibles\Historical Memorabilia\Police\Patches\Arizona". The seller is "lockmup1023" and is located in Scottsdale, Arizona.